Support CPQ Galleries offers in-house, USA based, quality, responsive support. Phone hours are M-F 9a-6p EST with 24-hour a day online support tickets. Support tickets filled out after business hours are responded to by the next working day. Trial Available? Yes, signup for a FREE 30-Day trail. Drive the system without commitment. The only feature you can't use during the demo is an actual checkout. Posting or Hosting Fees Zero. Post permanent online portfolios as well as timed-to-expire events - Never pay to post or extend! When does the photographer get paid for their online orders? Right Away. CPQ Galleries doesn't get between you and your money. You collect your own retail sales via PayPal or Authorize.net. We'll show you how - It's Simple! Can I keep the website I have? Yes, just add a link to your website that points customers to your CPQ Galleries storefront. Can I have an example of CPQ Galleries "sales consulting"? Our research and metrics indicate that incentives for early buyers return higher dollar averages per order. Offer "Timed-to-Expire" Discounts to encourage early orders. 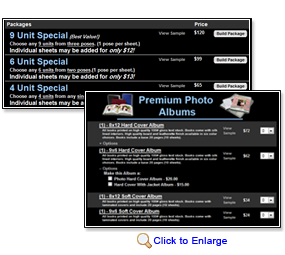 CPQ has teamed up with SimplePhoto on a great solution for online photo sales! Read all about the great features and signup below. SimplePhoto offers low-risk commission based pricing with no contacts, cancel at any time. No per image fees or credits to post. We work as a commissioned sales agent for your photography business or studio. Since our fees are based on your sales success, our team works harder to insure you sell better! Connect your existing website to your storefront. Use your logo and your colors to create an indistinguishable transition between your existing website and your CPQ Galleries storefront. Don't have a website, no problem. We can help you register a web site address and set up new website with public galleries, contact information, and an easy to update control panel. CustomizableShoppingCarts Turbo charge your sales! A visually compelling yet user-friendly eCommerce system designed to maximize your customer's experience. 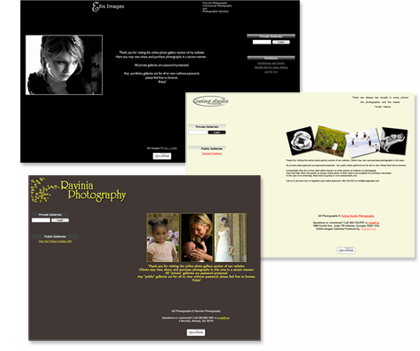 Dynamic shopping carts for all your different photography needs. Use coupons and discounts to generate more online sales. Book your portrait sessions online. Offer gift certificates and wedding registries! 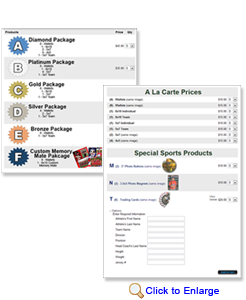 Product samples can be displayed in the shopping cart, as well as pop-up samples to help display your products. Gift Certificates Coupons Session Fees Sell more than photos. "The Gift That Always Fits"…Photography! Sell Portrait Sitting Fee Gift Vouchers with your CPQ Galleries Online Store…Open 24/7! Gift Certificates and Vouchers can be used as full or partial payment for portrait sittings, photographic prints, wedding deposits, framed photographs or any other product or service offered by the Photographer online or in person. Also, let customers book their portrait sessions and photography services with your Online Store. Give Brides a Photography Bridal Registry when they book your services for their wedding! Instead of an linen or another place setting, let friends and family purchase photography gifts that let the special couple cherish their memories for a lifetime or help them pay for their photography costs with gift certificates. ClickandSafe Offer a free web-ID program with your online proofing passwords. With Click-and-Safe, photographers may "give back" to the very parents who support their studios! 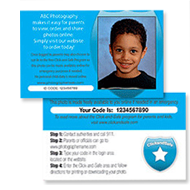 CPQ Galleries supports the creation of Click-and-Safe ID Cards, offering parents a wallet-sized card that contains their child's school photo, as well as their unique password to their private online gallery where a parent may purchase prints, OR download the child's watermarked photo in an emergency. Click here to join today or try the 30-Day Free Trial. CPQ Galleries consulting involves helping our members understand, set-up, or troubleshoot CPQ Galleries features and functionality. All consulting services are subject to the availability of the CPQ Galleries support staff. Lite and Pro members receive 2 free hours of consulting services per month. Premium members receive 4 free hours of consulting hours per month. Unused consulting hours do not rollover - any hours not used in a given month are not carried forward to future months. CPQ Galleries consultation is billed at the rate of $45 per hour, billed in hourly increments. CPQ Galleries must receive approval before paid consulting hours are dedicated. Time spent troubleshooting or fixing system problems are not counted as consulting hours.